GREAT. I’ve somehow found myself tangled up with a siren, a mermaid, and a hom-icidal wicked witch who once tried to strangle me to death. Way to go, Amber! The Sweetest Kind of Fate picks up where we left off. Amber is much more comfortable with her inabilities as a witch and her ability as a matchmaker. Although she continues to struggle with in her relationship with Charlie and seeing his “True” match. I like Amber. She is your typical teenager, working towards her dream of getting into Culinary school. Which she really does work hard at it, having three jobs that keep her busy but help her for experience toward her goal. I still like her close relationship with her mom. Maybe they don’t always see eye to eye. Mainly the amount her mom reveals about her past to her. Even though she might not be talking about it, they are able to have a conversation where her mom says, hey this is something I don’t want to talk or tell you about. Lots more teen angst. As Amber struggles with her friendship with her boyfriends match. She finds herself pulling away. Unable to deal with the constant visions that feel like they are being thrown in her face. I don’t think you can really blame her on how hard that can be. It also strains her friendship with bff Amani. I felt like everything happening though was a natural course. You could see where everyone was coming from in the situation. Yes maybe there is some overreacting but it wasn’t out of the realm of normal human emotions. It was all very natural. I like this books other plot. Which is dealing with the supernatural transformation of a siren to a mermaid. There is of course drama involved in because of who is making the transformation. Also the resurgence of nemesis Victoria. So there is a bit of mystery involving that, especially tying into her mother’s past. I love Amani. I would love to see a book featuring her POV. I think it would be really interesting. 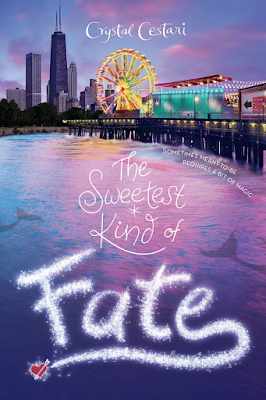 The Sweetest Kind of Fate is a great mix of witchcraft, cuteness and drama. I really enjoyed this installment. My debut novel, The Best Kind of Magic, arrives May 16, 2017 from Hyperion. Fol-low Amber Sand, a magical matchmaker who can actually see true love, as she takes off on a fun and romantic adventure toward happily ever after.